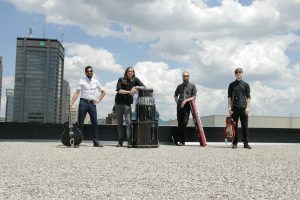 LONDON, ON, August 30, 2017 – Four-piece rock and soul band Mountain of Wolves will drop their much awaited third studio album and introduce an upstart record label on Sat. September 30. The new album, Poison, features the single Don’t Call My Name. The release showcase will feature opening act A Pairs 3, a local folk pop trio and before and after sets by DJ Johnny Wolf Saga (London/Toronto). Departing from their traditional folk roots Mountain of Wolves will debut their carefully crafted heavier rock sound that also incorporates elements of soul and funk. Out of this comes Forest City Records, a start-up record label geared to focus on the development, growth and strengthening of local London acts. In conjunction with his business partner Gracious is spearheading this new project with the hopes that in doing so he can be one of many instigators in the city that help see the community’s music industry thrive and gain greater recognition. The official launch of Forest City Records and release of Mountain of Wolves’ album is Saturday, September 30, 2017 at Design House London, 186 York Street, London, ON, from 7:00 pm-11:30 pm. Tickets will be sold in advance for $10.00 and at the door for $15.00. This will be an all ages, licensed event.